Reading is a popular and historically important town located in Berkshire. Situated around 40 miles west of London, the town has a vibrant and thriving city centre, and is surrounded by desirable and highly sought after Berkshire villages. The town itself was an important trading centre during the medieval period, and as such still offers stunning and unique historical homes and buildings, including the famous Reading Abbey. With so much to offer, Reading is home to a wide variety of commercial buildings, retail units and residential apartment blocks, all of which can be served by Tower Lifts, making us the perfect platform lift company for Reading. Platform lifts offer a cost-effective alternative to larger, traditional lifts in a wide variety of settings. 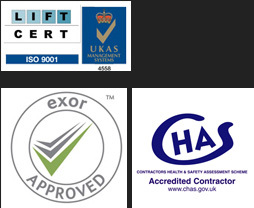 They are quick to install and cause limited disruption to the day to day workings of each individual building. They can also be custom made by a specialist platform lift company like ourselves, to blend in seamlessly with their surroundings. Whilst our platform lifts can easily traverse a small flight of stairs, carry visitors over split-level surfaces or even allow them to access other floors, they can also be fully integrated into existing stairs, or the floor, to make them as invisible and unobtrusive as necessary. Platform lifts also work well for those with limited budgets, looking to avoid the expensive of a traditional lift, and offer a far superior access option than just using a temporary ramp. The smooth ride makes them perfect for any passengers with limited mobility and wheelchair users alike. With a wealth of experience behind us, our platform lift services in Reading are tailor made to match the requirements of every individual situation. Platform lifts offer a simple and effective way for wheelchairs users or those with limited mobility to move freely between floors in any building. Also referred to as low rise platform lifts, these offer the ultimate in low rise lifting solutions. With available sizes of between 500mm and 3,000mm, our step lifts are well suited for installation in a factory or warehouse environment. Curved platform lift are specially designed for installation with curved staircases. Whether in a residential or commercial setting, these offer a convenient transport solution when there is limited available space. Without the need for a traction unit, this type of platform lift occupies far less space than a traditional lift would, making it the perfect choice for more compact areas. Our straight inclined platform lifts are designed for use with straight staircases, in both residential and commercial settings. Complete with first class manufacturing as well as anodised aluminium rails, airtight wiring and a special painted finish, our platform lift well be long lasting and fully durable. Utilising the latest technology for optimum performance with both our electric or hydraulic systems, vertical platform lifts are ideal for shorter distances or buildings with space and height restrictions. 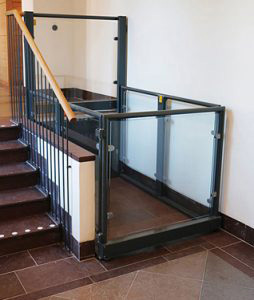 Suitable for installation in commercial and domestic environments, these lifts are ideal for assisting customers or staff with visual and physical disabilities.